Southwestern style homes are comfortable, eco-friendly and practical in dry climates. These homes are one-level, have flat roofs, covered porches, and vigas (round log ceiling beams). This style includes a variety of other styles commonly referred to as Pueblo, Spanish Revival, Adobe or Mission homes. 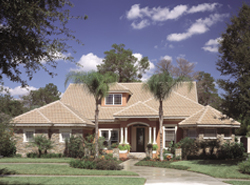 Typically found in the southwest, Texas and Florida, Southwestern home designs draw on Spanish-Colonial style and Native American architecture. With stucco walls over brick and irregularly placed windows, many of these house plans are asymmetrical in design. They perfectly suit the Southwest and New Mexico landscapes. The Perdana Luxury Modern Home has 4 bedrooms, 4 full baths and 2 half baths. 4887 Sq. Ft., Width 159'-4", Depth 93'-10"
The Wynhaven Luxury European Home has 5 bedrooms, 3 full baths and 1 half bath. 4925 Sq. Ft., Width 92'-6", Depth 80'-0"
House Plans and More features beautiful Southwestern house plans, with detailed floor plans to help you visualize your new new home easily. With such a wide selection, you are sure to find a plan to fit your style. Find the perfect dream home to be built for you. Check out House Plans and More for our selection of Southwestern home plans that you are sure to love.